According to what we are taught in the books of science, many thousands of years had to pass for the Earth to give birth to Oscar Wilde. It was a long gestation. But for all that, the ages which preceded his birth were not useless, since they provided a perfect compost. Certainly, there had been a choice to make. For Oscar Wilde to be born, the dinosaurs had to disappear. There could have been no co-existence: Wilde would not have tolerated their gross manners and their custom of stamping on wild flowers. He attracted love and hatred for the same reason: everybody understood his books perfectly badly. The hatred was certainly there, hiding itself under the kisses and applause. Doubtless he would have lived more happily and for a longer time if he had been hated earlier. The vaccine of hatred, when injected from childhood, gives the antibodies of resistance to it the leisure in which to develop. He wielded language like the most effective of whips, able to give blows as well as caresses. He used to think that he had tamed England. But the old lion stopped being amused and devoured him in court. The remains of the fallen prince were carried off to a cell in Reading Gaol, where, through two years, the last of his strength was eaten away by fatigue and by rats. Born in Ireland, he achieved death in France. England had only his life. Oscar Wilde is loved to-day, and there can be nothing against this love. One always loves dead artists, for they cannot defend themselves. Society kills them so that they can become the symbol of what society accuses them. Homosexuality and debauchery were unspeakable accusations under Victoria’s reign. Wilde’s crimes were otherwise. His genius was apparently for the spontanæous generation of brilliant ideas. The horrible truth is that Oscar Wilde laboured enormously. He would play the part of making things look facile through modesty. He used to make so much noise that the world failed to notice his humility. He spoke too much about himself for it to be understood how much he was pre-occupied by others. He took too much care over his appearance for others to see how little he worried about it. The great scandal of Oscar Wilde is the pleasure which he gives, more than that of which he tells. When he touches on the political, it is an aphrodisiac. It is an aphrodisiac when he writes about flowers, about stage costumes, about love, or about morality. A writer who has a style that excites thus cannot be forgiven. The weak reader feels himself to be guilty. Used to suffering in order to learn, he deduces that if he is amused, the experience cannot be taken seriously. Wilde has succeeded in creating an intellectual fusion between the Apollonian and the Dionysian. 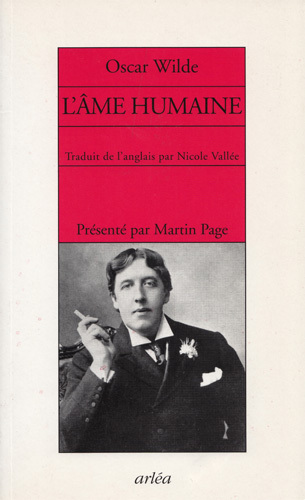 In finding Wilde funny, brilliant and original, one is only covering his secondary qualities, not seeing that he is, ahead of anything else, a tragic artist and thinker. There are artists who alienate the public by their inaccessibility. The inaccessibility of Wilde is his accessibility. Few have understood his despair and the depth of his revolt. If it were not forbidden to laugh in the amphitheatres of philosophy, he would be considered one of the great philosophers. Also, he is dead. That is not the least of his talents. The proper characteristic of great artists is not immortality but death. It is a stupidity to say that only great artists are immortal. The truth is that only great artists die. The rest of humankind only stops breathing. Go and gather together in front of the tomb of Oscar Wilde in the cemetery of Père Lachaise. Touch the stone and look upon the Sphinx. You will then understand that this grave is the only place on the planet where Oscar Wilde is not to be found.